Gardeners' societies differed from place to place in the Lothians and Fife. Many lodges had customs unique to themselves and these customs changed from time to time. Even the creation of the Grand Lodge in 1849 did little bring about systematic habits because within a few years there were lodges affiliated to at least three grand lodges. There were even short-lived bodies that seem to have, from their names, taken the esoteric side of the movement to extremes: in 1885 the 'Husbandmen Gardeners (Knights)' were based at Cordwainers' Hall in Edinburgh. The study of esoteric gardening had its own devotees. 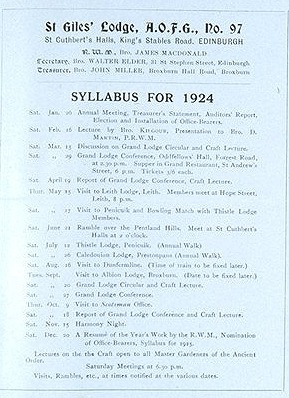 In November 1921 members of the Ancient Order created a special 'craft' lodge in Edinburgh called St Giles. It had no friendly society function. It was not even a forum for members interested in real gardening. Instead, it was open only to Past Masters and others interested in the rituals of the Order. One of these was Mr Black of Penicuik. Like many others he was deeply interested in the history of his society and collected what he could. Much of his research is still preserved in Midlothian.